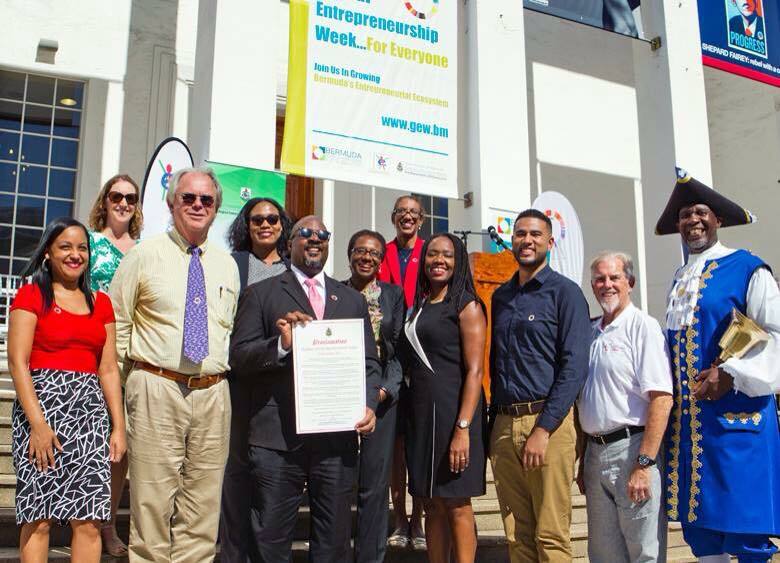 On November, 2nd on the steps of City Hall, The Minister of Economic Development & Tourism Jamahl Simmons, proclaimed November 13 – 20th and as Global Entrepreneurship Week and the entire month of November as Entrepreneurship Month in Bermuda. 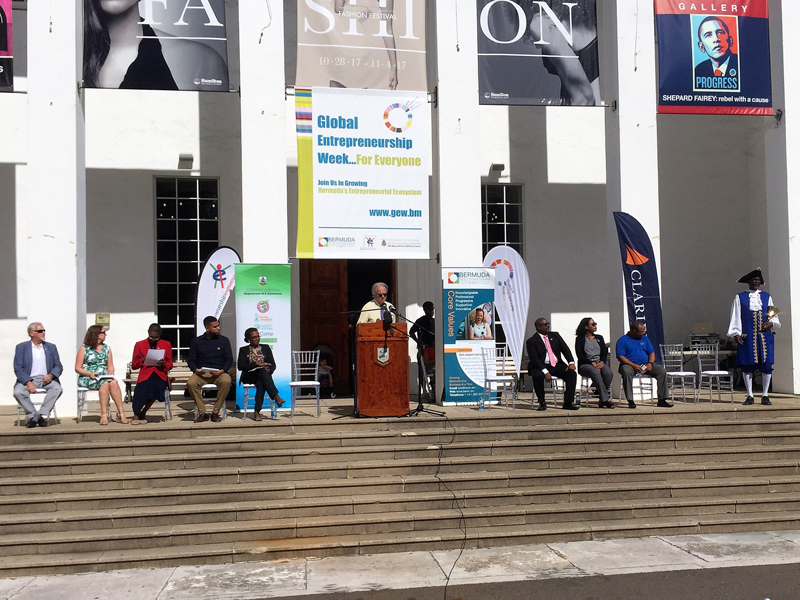 Global Entrepreneurship Week is a worldwide initiative that has grown to have over 160 host countries participate, 30,000 partner organizations that plan thousands of activities to engage millions of people. The Minister stated that “Through the work of the BEDC, as the GEW host organisation, in partnership with the Department of ICT Policy & Innovation and the Youth Entrepreneurship Initiative of Bermuda, GEW has grown significantly. In 2008, the host committee organised 6 events with 4 partners, and roughly 100 participants. At the proclamation event, the public was treated to an opening from the Town Crier and a welcome from Mayor Charles Gosling. Joining the Mayor and Minister Simmons on the stage were other dignitaries and sponsors, including Camille Hayley, representing the US Consul General’s Office; Pat Phillip-Fairn, Chief Product & Experiences Officer for the BTA, Dr. Marisa Stones, Director of the Department of ICT Policy & Innovation; Korrin Lightbourne, Marketing & Community Outreach Coordinator for the Chamber of Commerce; Joe Mahoney, Executive Director of the Youth Entrepreneurship Initiative of Bermuda and Linda Cook, entrepreneur and owner of Little Longtails. Those seated represented the partnership that has been formed across key organizations in an effort to support and encourage entrepreneurship. On the heels of the Proclamation, Minister Simmons attended the GEW Launch and Biz Camp award reception in the Chairman’s Suite at Chubb to launch the Bermudian activities of GEW and award the students that participated in the Biz Camp. The Minister welcomed parents and sponsors to the event stating “Today we also recognize the achievement of some of our budding entrepreneurs through the Biz Camp programme. This programme run by GEW host committee member, Youth Entrepreneurship Initiative of Bermuda and sponsored by GEW Host Committee Member, the Department of ICT Policy & Innovation is one that the BEDC has participated in for years. The team at BEDC supports Biz Camp by presenting to the students and judging the pitches. Following the Minister’s welcome remarks, Jamillah Lodge, Information Education & Communications Officer for BEDC and GEW Project Manager, reviewed the many activities and events that were planned for the month of November and focused on some of the signature events including the Rocket Pitch Competition and the Tech Awards which too are celebrating a 10 year anniversary along with GEW. The event then turned to the first official activity for GEW 2017, the Youth Entrepreneurship Initiative’s Prizegiving for their 2017 BizCamps. 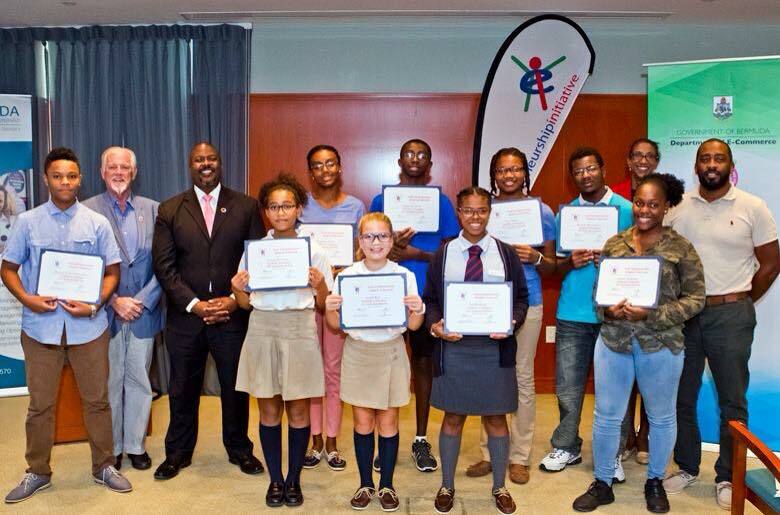 Joe Mahoney, Executive Director of YEI and GEW Host Committee Member was joined by Minister Simmons in presenting certificates to the teenagers who completed the intensive 7-day program held this past July and over the October break. During BizCamp students learned about opportunity recognition, pricing, marketing and many other aspects of running a company and developed their own business idea. The audience was delighted to hear BizPlan presentations from 2 of the participants, Toriah Smith, with Imagine Me Academy a Special Education tutoring service and Shalom-Yasha Cannonier, a retail and manufacturing business specializing in prosthetics and exoskeletons for military and recreational purposes. Mr. Mahoney remarked that “seeing the students develop their plans over the camp was extremely fulfilling and makes me proud. The course is extremely intensive and all of the participants should be commended for seeing the Biz camp through to the end.” Mr. Mahoney closed the event by thanking the sponsors of GEW and Biz Camp specifically acknowledging Chubb for sponsoring use of their space.